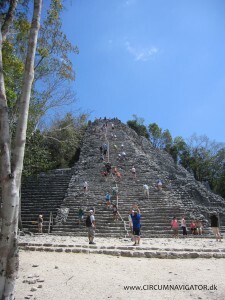 The Mayan calendar and culture - Is it the end of the world in 2012? 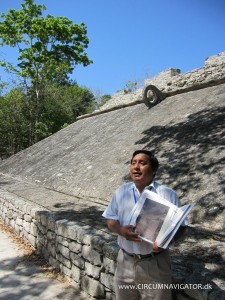 The Mayan myth – Is it the end of the World? Very soon it is the 21st of December – is it the end of the World? On the Northern hemisphere it is the shortest day of the year, and in fact a day I am personally looking very much forward to, because it means that the days will start getting longer again. I tell you, in Denmark the amount of hours with daylight are very few during winter and mostly our winters are grey and rainy, so altogether a somehow dark experience, that caused winter depression for a lot of people living here. 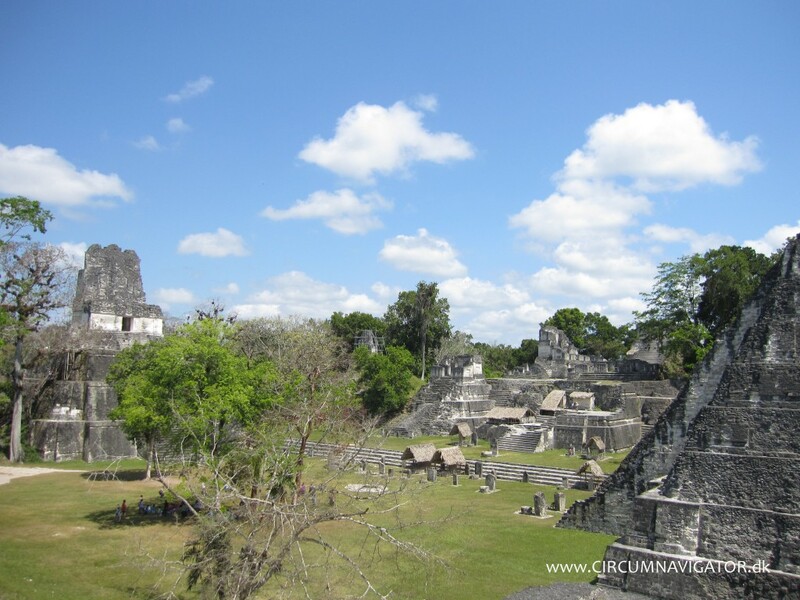 In April this year I travelled around Guatemala, Belize and Yucatán in Mexico, and went to see three different ancient Mayan cities and thereby got in touch with and learned more about the Mayan culture. I was personally assured by all the Mayans I met, that this will not happen. It is just the new beginning of another Long Count calendar. So let’s hope this is true and let’s start a new beginning. The start of the Long Count calendar is 11th August 3114 BC, so it is obvious to say that this is the date the Mayan civilization started, but according to findings and carbon dating it is more likely around 2600-1800 BC. 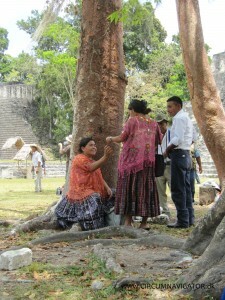 The area of the Mayan civilization is in the present-day the southern part of Mexico, Belize, Guatemala and some parts of Honduras and El Salvador. At around 900 AC the civilization collapsed, but even though the different Mayan cities are now abandoned, the Maya people and the culture is still very much alive in Central America. 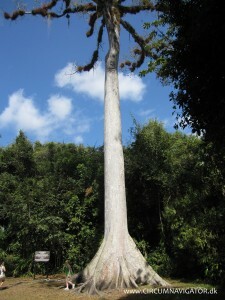 The reason why the Mayan had to abandon the great cities of Tikal and Cobá is believed to be exhaustion of the agricultural land around the cities and tree cropping that lead to reduction of rainfall followed by drought. 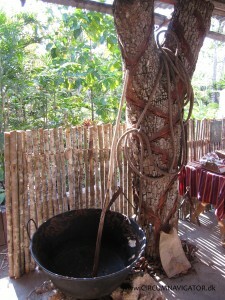 Both my visit to Tulum and Cobá in Mexico was a part of the daily excursions during my stay at Amansala Eco Chic Resort. 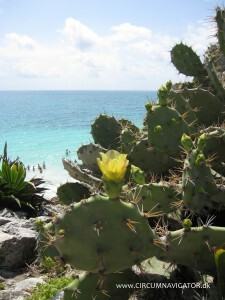 Read more about this on Creative visualization at yoga class taking me back to Tulum. 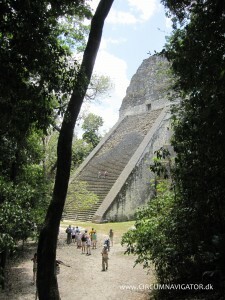 The fascinating Cobá ruin is situated deep in a tropical jungle 48 km northwest of Tulum. It was home to 55.000 people at its peak. 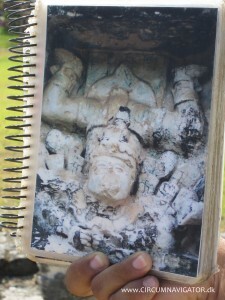 Only a few of the estimated 6500 structures have been excavated and are spaced apart. A great way to get around is by renting bikes, but be aware that even before midday it does get extremely hot in the dense forest. 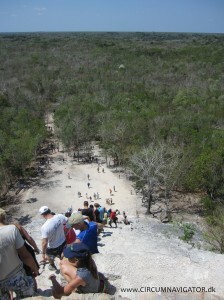 It is possible to climb one of the pyramids to get a birds eye view on the jungle around Cobá. Though you need to be fairly fit and secure with yourself climbing up and down, since there is only one safety rope and the stones at some parts are very slippery. 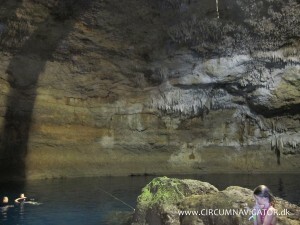 After a hot day in the jungle it was very refreshing to jump into one of the many cenote’s (sinkhole) on our way back. 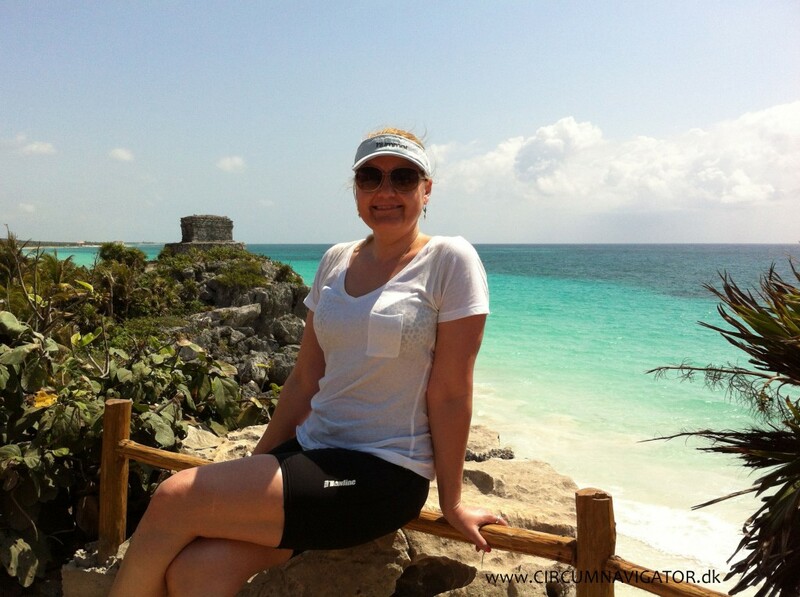 From the Amansala Eco Chic Resort it is only a good bike ride to Tulum which is beautifully situated atop the cliffs on the shores of the Caribbean ocean. It was an important port for the Mayan civilization and to the other three sides it has thick walls to protect from possible enemies. 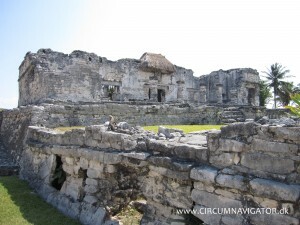 It was one of the last Mayan cities to be abandoned and even in the first years of Spanish occupancy in Mexico, Mayans still were living here. 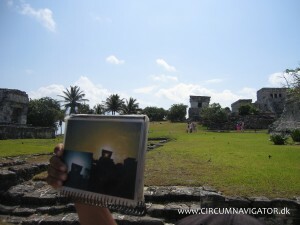 At winter and summer solstice the sun shines through one of the small temples at Tulum. 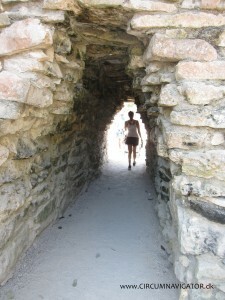 The guide told us that the inhabitants of Tulum buried their ancestors below the floor of their own house. Perhaps that’s why so many lizards were hanging around the ruins. 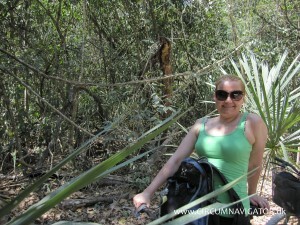 After Tulum, I went first by the ADO bus (can be recommend as transport in Mexico) to Chetumal close to the border of Belize, and the following day with San Juan bus through Belize to the beautiful Flores situated at the lake Petén Itza in Guatemala. 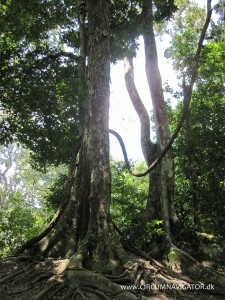 In Flores, I arranged a bustrip to Tikal on one of the following days. I was picked up at 7 AM and the drive took a little more than an hour. 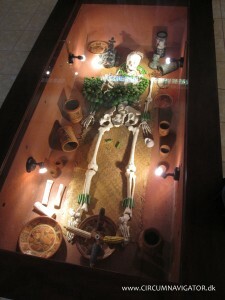 On the way we stopped at a small shop and museum where a replica of a Mayan grave was displayed. 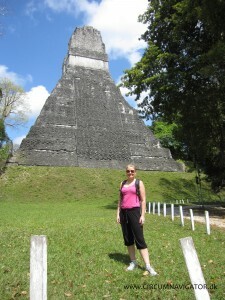 Tikal is today situated in the deep rain forest and was when largest inhabiting up to 200.000 people. 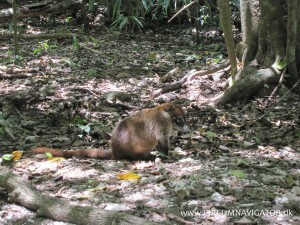 It is a huge area and if not one full day, as I did, then reserve 2 days for exploring Tikal. Even though I did get a glimpse of the wild life during the daytime, it was said to be much more in the early morning or late evening. 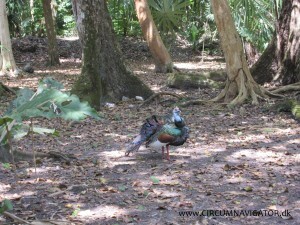 I saw yellowtail birds, ocellated turkey, coatimundi raccoon and spider monkeys. 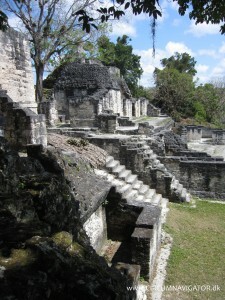 Only 20 percent of Tikal’s structures have been excavated, but still there is a lot to see. 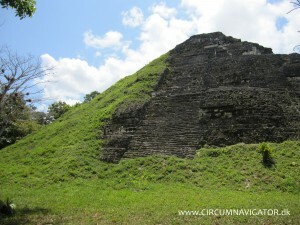 Some of the pyramids are up to 61 meters high, and from Templo IV you have a view over many small green hills under which there is another pyramid. After walking several kilometers around the rain forest and the many ruins, I ended the day with resting at the Gran Plaza, where Mayan families were camping out in their colorful clothes. 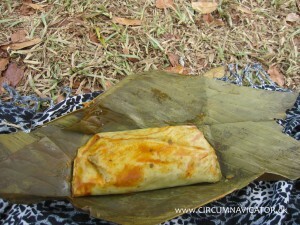 They even offered me a taste of their traditional food stewed and packed in banana leaves. 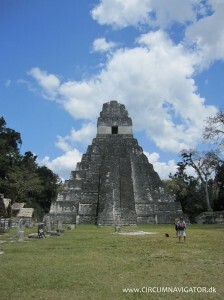 Out of the three ancient Mayan cities I visited in April, Tikal was indeed the most spectacular. I would love to be there on the 21st December to celebrate with the locals and other tourists, but am also looking forward to X-mas with my family here in Denmark, even though it is the somehow darker winter season.